Here you can see different routes that we have personally selected . There are many more ! We recommend you visit the page to see even more WWW.WIKILOC.COM or upload your own . Circular route of 20.7 km and 768 m of ascent . Discover the village of Santa Engracia enturonat and the people of vultures Gurp . Can be shortened to reach only Santa Engracia . 10,78km vault and 523 m of altitude . Discover the hermitage of Sant Pere de les Maleses and what is hidden in the Cave of the Serpent . Rise circular Roc Pessonada with 6.21 km away and 407 m of altitude . Fried has two steps without much difficulty for people accustomed to the mountain. 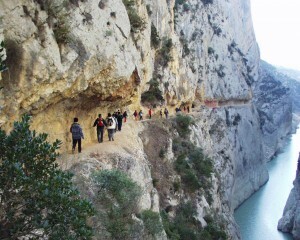 Excursion without much slope , leaving from Bridge Montañana have some other fourth round four back. It can extend up the catwalk Portusa , ue linking Catalonia with Aragon. Easy hiking tracks around Talarn good roll and without technical difficulties . We start cycling along a stretch of secondary road , almost no traffic , which leads to the beautiful town of Gurp , protected by spectacular rock walls where you can see some vaumes with stone buildings that formerly had been inhabited and later , were used as corrals . After undo a stretch of road will pass close to the ruins of the Romanesque church of Sant Miquel and then begin a beautiful fall ( has a rocky stretch force ) crossing vineyards with the same name , ownership Torres house , which leads again to Talarn . Easy hike around Tremp Talarn tracks and good roll and without technical difficulties , part of a rocky stretch force shortly after Temple and another sent the final descent . Pedal a beautiful mosaic of forests and traditional crops typically Mediterranean enturonat to ascend to the town of Sant Adrià . Subsequently , as in the above route will pass close to the ruins of the Romanesque church of Sant Miquel and then begin a beautiful decline crossing vineyards with the same name , owned by the Torres house , which bring back to Talarn . For the more daring downhill stretch can be done to end a variant technique through a path that leads directly to Talarn ( variant in red on the map) . Varied itinerary courts without too great roll and technical difficulties through landscapes middle mountain villages and little inhabited , even by some totally uninhabited . After the neck Orcau can choose to track down the middle of a forest or along a narrow path more technical ( variant in red on the map) . Descend down where we will enjoy a spectacular view of the uninhabited Montesquieu , perched atop a small hill and the Sant Antoni reservoir and the Pyrenees as a backdrop. Since we only follow the aforementioned lack swamp by his side, dropped to Tempera and finally back to Talarn . Physically demanding route which surrounds the reservoir of San Antonio and have excellent prospects of all natural pot where this is located, with the Pyrenees as a beautiful backdrop. Cycle along the western shore of the reservoir, through both beautiful places like the village of Aramunt or “Xiringito” where we can swim and a drink (if the high season!) Before tackling the second part of the itinerary , which leads to the town hall with its medieval walled town, so well preserved is well worth a visit. Then we will have the last long climb up to Santa Engracia, where we will enjoy a privileged view of the entire Tremp basin, with Marsh Wineries and Montsec in the background. Now we will just go down to Talarn, which can choose between a technical and demanding path that leads directly to Talarn, or down the road comfortable and quiet, always with spectacular views towards the south (red variant map). Route very demanding physically and technically , steep slopes and in poor condition , especially any stretch of the Sierra crest Gurp and the final climb to Pui of Llaràs at 1692 meters. As a reward we will have a spectacular view and a unique view of the basins of the Noguera Pallaresa to the east and Noguera Ribagorçana west and the Sierra de San Gervàs and many of the peaks of the Pyrenees between notably the Turbón and ceiling throughout the range, Aneto . Lonely and inhospitable lands pedals , a wild and rugged environment where necessary precautions and bring plenty of water , because it can not find the way to Santa Engracia . Route to avoid the midsummer heat in winter or summer .